Emergency situations involving breakdowns and towing call for different kinds of supplies that increase visibility. 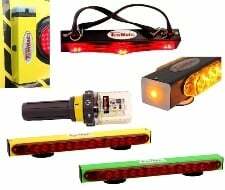 You will find some of those supplies in our Towing Lights inventory. For your own safety, make sure you are as visible as possible next time you find yourself in an emergency. Being visible could mean the difference in terms of your personal safety. For light duty applications, we carry light bars of various kinds. We also offer strobe bars with full, 360° coverage – which can be very important in bad weather conditions like heavy fog or snow. For your trailer, we carry an oversized load banner with wireless lighting. Feel free to browse our entire inventory of towing lights and supplies to find just what you need. Most of the products in this category can be purchased in bulk, saving you money while outfitting your entire fleet of trucks and trailers.